Avery Brooks famously asked, “Where are the flying cars? I was promised flying cars! I don’t see any flying cars! Why? Why? Why?” Elan Mastai’s book finally provides the answer. Simply put: we had it — flying cars, routine space flights, robots/other tech dressing us, feeding us, doing the everyday jobs that need to be done so that humans can focus on working in labs to make the world an even better place, to make the next technological leap forward. Essentially, everything that Science Fiction of the 1950’s told us to expect, we lived in George Jetson’s world. Until July 11, 2016 when the first time machine was turned on and things went wrong, resulting in 40 years of history being rewritten and one man — Tom Barren — was the only one to know that we are now living in a dystopia. It’s a dystopia for everyone on Earth, but Tom, that is — his life in the 2016 that we know is much better than it was in the “original” 2016. So now Tom has to decide, does he try to restore the timeline (if he can even figure out how to do so), or does he keep things the way they are? That’s less than you can see on Goodreads/Mastai’s site/Web retailers — and yet I think I gave away too much. But really, that’s barely scratching the surface. There’s a great mix of detail to the science (at least the ideas and theories behind it), yet keeping it at the level where we don’t get bogged down in technicalities (and kept Mastai from having to work them out) — he gets away with it by comparing it to the way that we don’t really understand how hydroelectric dams or incandescent light bulbs work. There’s the literary equivalent to that scene from The Wire‘s 4th episode — it’s a mixture of genius and profanity and poetry. Mostly profanity. We’re going to be talking about Elan Mastai the way we recently talked about Ernest Cline or Andy Weir next year (assuming I can predict anything) — and he deserves it. The voice grabs you right away from the humor, the honesty — the trouble with time travel grammar. I really wish that Jonathan Tropper’s endorsement of the book wasn’t right there on the front cover, because it feels like a cheat to compare Mastai to him now, but I want to. He’s got the same mix of humor, heart, drama, inspiration as Tropper, he just blends science fiction themes in with those. Tom Barren’s a great character (a questionable person, but a great character) that you’ll love spending time with. There are really a lot of great characters here, but he’s the only one I feel safe discussing. There are characters with warts, strengths, weaknesses, courage, bravery, humanity in all shapes and sizes — some noble, some despicable, some pathetic. As is frequently the case, seeing multiple versions of the same characters in the various timelines tells you a lot about the people and/or worlds they live in. Tom’s father, the one who developed the time machine — has some fantastic theories about time travel — it’s not just about time, it’s about space (between the earth’s rotation, movement through space, etc. ), and for time travel to be really possible, both have to be addressed. Not only does it clear the TARDIS from every critique of time travelers/machines mentioned in the book, but it’s a really, really good point. It’s one of those magic books that you don’t want to end, because you’ll have to leave the characters and world — but that you can’t get through fast enough because you just have to know how it turns out. Is it flawless? No, I’m sure it’s not, but unlike ever other book I’ve read this year (including the ones I’ve loved), I can’t think of a single problem. That says a lot to me. I have not been able to stop talking about this book for a week now — I think my wife and kids have started ignoring me when I bring it up. 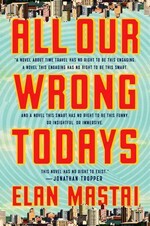 All Our Wrong Todays is a book that practically demands over-hyping — it’s only a huge amount of restraint that keeps me from spilling everything. I have a list of people I want to buy this for (started compiling it when I was about 10% finished), and the list is currently long enough now that I wouldn’t be able to buy any books for myself until June 2017 — so, sorry everyone, buy your own. I don’t know if I’ll be able to watch/read more time travel again — especially time travel involving love stories — but man, it’s absolutely worth it if this was my last. Pre-order this one now so that you can dive into it as soon as possible. Disclaimer: I received this eARC from Dutton via NetGalley in exchange for this post — thanks to both for this.